Middlesbrough boss Gareth Southgate is urging his players to play themselves into new England boss Fabio Capello's plans over the following months. Southgate won 57 caps for England as a defender and feels English players have the opportunity to make an impression with the new international regime. 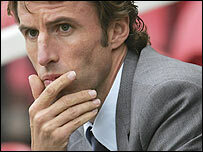 Southgate said: "The great thing for all players with the new manager is they have no preconceived ideas. "They'll judge them on what they see in the first few months." Who will make Capello's England squad? Boro have two senior England internationals in their squad in Luke Young and Stewart Downing and Gary O'Neil was capped by England Under-21s. David Wheater, Lee Cattermole and Adam Johnson are current members of Stuart Pearce's Under-21 side.